It may seem strange that you can power a small light bulb, such as a light emitting diode (LED) using a potato, but it is possible. If you insert two different types of metal into the potato a chemical reaction takes place, as the potato contains phosphoric acid; it’s a bit like acetic acid or vinegar. The metals act as electrodes and electrons flow from the negative electrode to the positive electrode inside the potato. This creates a small electrical current. 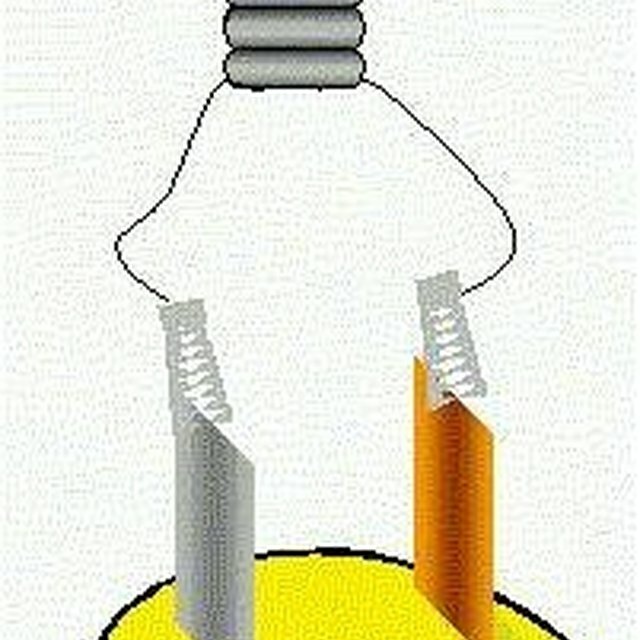 If you wire a small light bulb to the electrodes, the current illuminates the bulb, so you get a potato lamp. Place the potato on a table. Insert the zinc nail into the potato slightly off center. Insert about 1 inch of the nail into the potato. Insert the copper nail into the potato about 1 inch away from the zinc nail. Make sure the same amount of nail is inserted into the potato. Attach the red wire from the LED to the end of the copper nail. Use a small strip of electrical insulating tape to hold the wire onto the nail. Attach the black wire from the LED onto the end of the zinc nail. Use tape to hold it in place. As soon as you connect the black wire to the nail the LED illuminates and you’ve made a potato lamp. Physlink: How Can a Potato Be Used to Light a Light Bulb; Lee Ellen Benjamin, M.A. Stevens, James. "How to Make a Potato Lamp." Sciencing, https://sciencing.com/make-potato-lamp-8774396.html. 24 April 2017.